Usually, I know what the story is. Life seems to segment itself sort of naturally, and so you collect experiences and anecdotes that define what's going on, with you, for those weeks or months. Little stories of who you are and where you're at. I've been thinking about March. And what a weird, potent, transition month it is. The March right after I turned nineteen was magic. I wore a red dress that was too short and too tight. Everyone lived for the weekend. I stood up and tried to hug the wind through the sunroof of Alison's station wagon, like they do in that book, only I had never read that book. And we got drunk and went swimming at three am and afterwards I sat, shivering and braless in the diner that played heavy metal, and ate hashbrowns and migas, feeling so happy it hurt. The following March was dismal. My heart was fragile as an egg. In an effort to un-slump myself I drank buckets of coffee, ate doughnuts every day, and rode my bike late at night. It felt like nothing was ever going to happen, and actually, that March nothing did. This March is like Turkish coffee. It tastes a little wild. The first sip lasts for only an instant. But in that instant, the coffee tastes like an ancient pine tree, or a whole cabinet of spices that sit soft and dusty on your tongue before melting away. The other night, I picked up two random German boys on the street, and then Julián came and we ate sunflower seeds and drank cheap beer and went to look for a party on a rooftop terrace, but got lost instead and knocked on a random door and ended up in the apartment of a group of Americans from Maryland. An experience that pretty much sums up my story of March so far, i.e., strangeness and spontaneity, the instability that comes from moving constantly, and always running away from and also sitting with, a specific deep kind of loneliness. That is what March feels like. 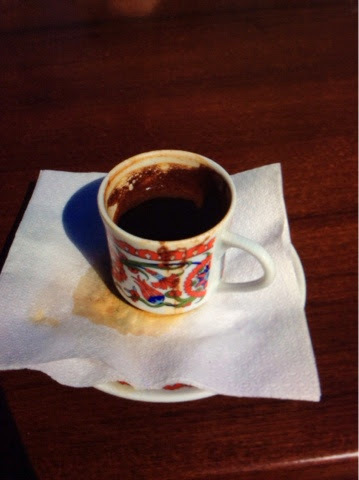 I want to wring a story from all this randomness, and give it to you with a cup of Turkish coffee. And we'd taste the ancient trees and the dusty spices, but only for a second, and you would maybe smile, maybe cry while I told you the distilled version of this March, the one with a beginning, middle and end. Because March isn't over yet.